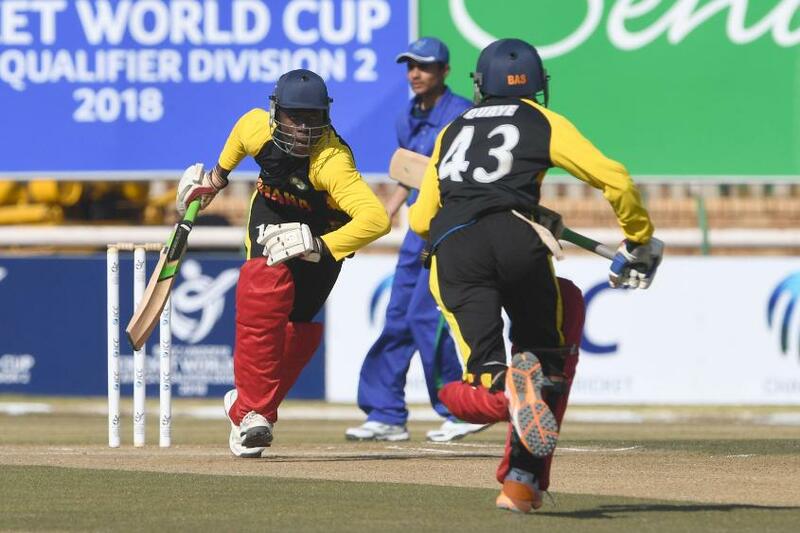 Ghana were the big winners on the second day of action in the ICC Under 19 World Cup, Africa Division Two qualifier tournament in Potchefstroom. Having lost to neighbours Nigeria on the opening day, Ghana took out their revenge on a hapless Lesotho team, amassing 337/7, before routing their opposition out for just 67. That gave Ghana victory by a massive 270 runs, and they had Richmond Baaleri (82) and Paul Ayoleyine (99 not out) to thank for the huge total. The latter narrowly missed out on the first century of the tournament, as he took full advantage of the excellent Senwes Park surface. Baaleri and Ayoleyine added 161 for the sixth wicket as they blew Lesotho away. In reply, Lesotho lost two wickets from the first two deliveries of their innings, and then never recovered. Aaron Boamah helped himself to 5/10 in just 5.2 overs, as the end came very quickly for Lesotho, who were rolled for just 67. Nigeria, meanwhile, continued to live up to their billing as one of the tournament favourites, as they strolled to a 10-wicket victory over Mozambique. The West Africans bundled out their foes for just 56, in less than 20 overs. Mohameed Taiwo was the destroyer-in-chief, with 4/10 in seven overs. Nigeria then knocked off the runs in less than ten overs, earning themselves a relaxed afternoon. In the most competitive match of the day, Botswana showed terrific heart to hold off Rwanda, winning a low-scoring affair by 19 runs. Batting first, Botswana was bowled out for 120, with 14-year old opener Kgosi Machailo notching a vital 30 from 41 balls upfront. Skipper Phemelo Silas chipped in with a handy 27 in the middle-order, as the exquisitely named Parfait Mugisha 5/21 for Rwanda. Chasing 121 to win, the Rwandans lost wickets at regular intervals, as Silas made a great start with the new ball. The Botswana captain added figures of 4/22 to his 27 runs, to dominate the contest. The winning strikes were delivered by Zaidul Islam for Botswana, as he snatched 5/21, with a run out sealing Rwanda's fate at the end. In the final match of day two, Sierra Leone marked their first outing with a comfortable win over Tanzania. Salimini Saidi again stood out with the bat for Tanzania, who batted first. Saidi stood alone, with 33, as his team crumbled around him to be dismissed for a paltry 96 in 32.4 overs. Chernoh Bah was the standout bowler, with fine figures of 5/20 in eight overs. Sierra Leone then made easy work of their target, cruising to an eight-wicket win with 18.1 overs to spare. Keeper John Bangura (48 not out) and Emmanuel Akpo (37 not out) got together at 8/2, but weathered that early storm to put together a 79-run alliance. The action resumes tomorrow with Sierra Leone taking on Botswana, Ghana play Mozambique, Tanzania face Swaziland while Lesotho battle Nigeria.